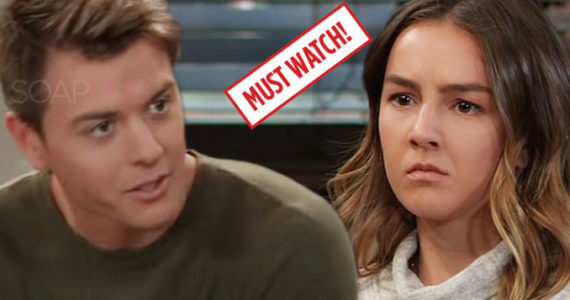 The General Hospital recap for Tuesday, March 19 features Oscar’s devastation at learning his ultimate prognosis. Oscar (Garren Stitt) was having a grand old time with Joss (Eden McCoy) and Cam (Will Lipton), but then Joss received a notice her volleyball team was invited to a national event and she didn’t want to tell him it would be in August. After his friends left, his parents and Terry (Cassandra James) returned to Oscar’s hospital room and Terry had bad news. The tumor had grown and she gave Oscar at the most six more weeks to live. A devastated Oscar asked to spend some time alone with his mother and he thanked Kim (Tamara Braun)for always being there for him and said he knew it had to be hard for her to raise him on her own. He then admitted he was scared. When Cam left Oscar’s room, he visited Franco (Roger Howarth) with some baked goods from his younger brothers. He had already told Oscar he wished his mom would dump the guy, and Liz (Rebecca Herbst) almost did. But, Drew (Billy Miller) talked her out of it and she told Franco he could come home. Elsewhere in the hospital, Alex taunted Anna (Finola Hughes) about memories and Anna raged. In exchange for the info Anna wanted, Alex demanded her freedom and her eyesight. Seems fair. Ava was drunk and Carly told her to pull herself together for Avery’s sake. She also told her not to blame herself for Kiki’s death and had her call Julian (William deVry) to take her home.